There is something about chicken and rice. It’s easy, it’s great comfort food, it’s delicious. My kids love it (well, except for my daughter who is expressing mild interest in vegetarianism). I saw this recipe in on of those America’s Test Kitchen compilation magazines (they should never stop making them because I end up buying every single one of them–I don’t care how many times those recipes have been published elsewhere, for whatever reason, it seems like I’m always seeing them for the first time.) I knew as soon as I started reading it that I would love it. The first time I made it, I used the two poblano peppers it calls for. I don’t cook with poblanos very often, but when I have in the past, they’ve always been on the mild side. Well, these poblanos were not mild. These poblanos left blisters on my hands, which should have been the first indication that I should have scaled back on the pepper usage, but alas, I was stupid. To further the stupidity, my husband and I actually ate it and our mouths were burning the rest of the night. So. Learn from our mistakes. Turns out that just like any other pepper, poblanos can vary widely in heat, even when the seeds and membranes are removed. Like I said, I’ve had some that aren’t much hotter than a green bell pepper and then these were much hotter than jalapeños. My advice is to sniff the poblanos in the grocery store; if they tickle your throat, they’ll be spicier. When chopping them test a small piece to determine how spicy each pepper is. Average poblanos will be spicy but not burn-your-mouth hot. You could add anywhere from 1/2 of a poblano to all of both poblanos, depending on how hot they are and how much heat you want in the dish. Just remember you can always add more, but you can’t take them away once they’re in there, so if heat is a concern, start small. The good news is that once we scaled the pepper usage down (I usually use between 1/2-1 pepper, depending on how big and how hot they are), this has become one of our favorite meals. 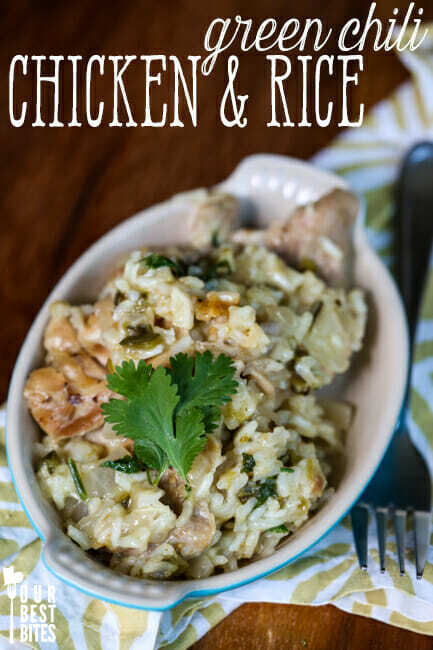 The chicken thighs are moist and flavorful, it’s easy, only requires a handful of ingredients that I almost always have on hand, and everyone in my family will happily eat it. Can’t beat that, right? 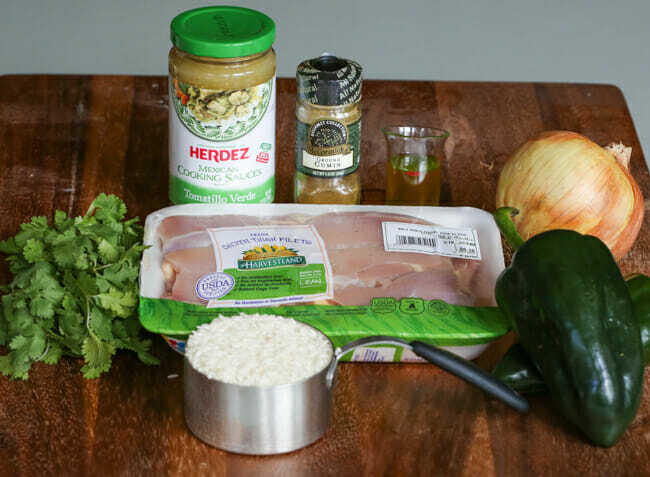 You’re going to need 1 1/2 pounds of boneless skinless chicken thighs, rice, onions, garlic, cilantro, green enchilada sauce, and cumin. 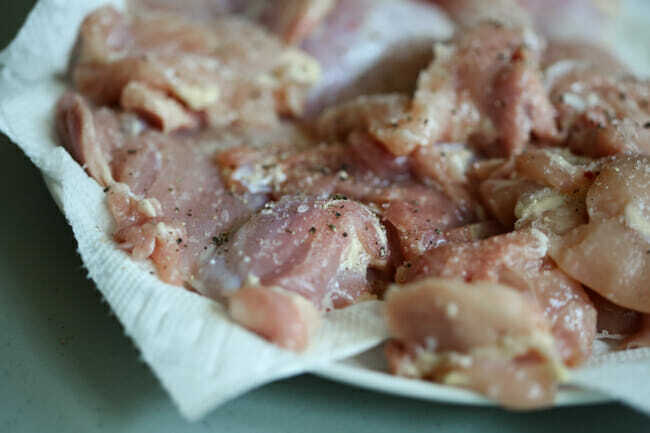 Pat the chicken dry with paper towels and season both sides with salt and pepper. Heat 1 tablespoon of oil a 12″ skillet over medium-high heat. When very hot, add the chicken thighs and cook for about 5 minutes or until golden and crispy on one side. Transfer the chicken to a plate and set aside. I took a picture of this, but half-cooked meat creeps me out, so I left that out. Is that weird? Add the remaining 1 tablespoon of oil to the pan and allow to heat for about a minute. Add the chopped onions and peppers and cook for about 5 minutes or until the onions are translucent. Add the garlic and cumin and cook for about 1 more minute. Add the enchilada sauce, water, and rice and bring to a boil. Place the chicken, brown side up, on top of the rice. Reduce heat and cover. Cook for at least 20 minutes, stirring about every 5 minutes to prevent the rice from scorching. When the rice and chicken are cooked through, it’s done (higher elevations will take longer, maybe even twice as long, so plan accordingly.) Add the cilantro and stir to combine. Serves 4-6. Note about poblanos: Just like any other pepper, poblanos can vary widely in heat, even when the seeds and membranes are removed. I’ve had some that aren’t much hotter than a green bell pepper and others that were hotter than jalapeños. My advice is to sniff the poblanos in the grocery store; if they tickle your throat, they’ll be spicier. When chopping them test a small piece to determine how spicy each pepper is. Average poblanos will be spicy but not burn-your-mouth hot. You could add anywhere from 1/2 of a poblano to all of both poblanos, depending on how hot they are and how much heat you want in the dish. Just remember you can always add more, but you can’t take them away once they’re in there, so if heat is a concern, start small. Heat 1 tablespoon of oil a 12″ skillet over medium-high heat. When very hot, add the chicken thighs and cook for about 5 minutes or until golden and crispy on one side. Transfer the chicken to a plate and set aside. This sounds delicious. And I love that it’s one dish. I can tell it’s destined to become a new family favorite. Oh yum. Cannot wait to make this. You want to hear about peppers varying in heat? The reason I’m up this early is because my hands and face have been burning all night long: last night: we got some ” cherry bomb peppers” for canning. My sister tried one and says ” oh they are pretty mild”, so I take a massive bite out of the hottest pepper I’ve ever eaten. It’s been 12 hours and my throat still is aching. Side point: anyone have a need for 5 pounds of cherry bomb peppers or ring of fire peppers?!?! Because I am done. This sounds really good. I want to try it with quinoa! I have this recipe on my radar….I plan on fire roasting and peeling my poblano peppers first though! This looks delicious and easy to do. When do you add the cilantro, just at the end? Ok, I admit, I was skeptical about this one. But. I made this tonight and it is DIVINE. Homey, comforting, so creamy. You guys have to make this ASAP. Seriously, it was so, so good that I kept sneaking back to the skillet to spoon one more scoop of the creamy rice and tasty chicken. I made it with a can of El Paso mild green enchilada sauce and used chicken broth instead of water. SO GOOD!! I served it with a sliced avocado and a squeeze of lime juice and it was delicious! 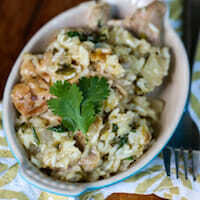 Chicken thighs are a must for this dish! Thanks, Kate, for another winner, winner chicken dinner! Mmmm, this is gonna be dinner tonight. I’ll try anything with green chile in the title. For the green chile sauce I gotta stay close to my New Mexico roots. You should try this with New Mexican green chile sauce. You basically make a chicken gravy but add in sautéd onions and New Mexican roasted green chile’s. At the end top it of with a bit of half and half… to die for! Thanks for the recipe! We just came back from New Mexico from vacation and the food there is to die for. We really loved the stuffed sopapeas would like a recipe for those if you have one. Could ou please tell me more about the green chile sauce. I just made this tonight for dinner and it was easy and so very tasty. I didn’t buy the correct peppers, since they didn’t have them at my grocer, but I did use a spicy kind and a lot of green bell peppers to compensate. It was so yummy and just the right amount of spice. A keeper. My family of 5 loved this tonight! I went to what I call the “ghetto” grocery store that is closest to my house that doesn’t always have everything, and the peppers they had that looked like poblanos were marked “green frying peppers” or something similar. I went for it and put two in (I’m pretty sure they were actually poblanos). Very little heat, but the dish turned out fabulous. I added a little extra chicken (I knew my hubby would down the whole pan) by using a second pan to brown it – there wasn’t room in the first for more chicken initially. Then the chicken shrunk down enough that I could put it all in one pan for the braising/simmering part. It was so delicious and I will definitely make it again. I used the Frontera sauce pouches recommended, as that was what my grocer carried. When do I add the cilantro? I made this and it was GREAT. A perfect single-serve lunch, and it froze well too! I didn’t use cilantro and subbed bulgur for the rice. Made this for dinner for my family last night, and it was a huge hit! My rice took a full 30 minutes to cook, FWIW. Two out of three kids gave it an immediate thumbs-up, and the addition of a dollop of sour cream won over kid number 3. Winner, winner, chicken dinner! I made this last week, and my three-year-old said, “Mom, I really like this!” He never says that!!! I tried using quinoa instead of rice like one person suggested. It was really good. Is there any reason that this can’t be finished in the oven? I’m wondering if I could do some of the steps ahead of time, and then pop it in the oven closer to dinner time. What do you think? Can you use canned diced green chilies instead of fresh poblano chilies? If so, a 4 oz. or 7 oz. can? Just wanna drop in to say still making this in 2017 and it’s still a huge hit for my family of 7. I always double it and there are never. any. leftovers. Yaaaaaay!! I love to hear this! !